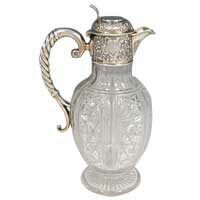 We are your one stop destination for acquiring beautiful Crystal Jugs. Ranked as a leading Crystal Jug Manufacturer, Exporter and Supplier, we offer an exquisite range of Antique Crystal Water Jugs. The intricate designing and classy appeal of our Antique Crystal Jugs, makes us distinguished from other Antique Crystal Water Jug Exporters. The Crystal Jugs are manufactured with superior quality material and have a perfect blend of magnificence and functionality. Additionally, they have been fitted with intricately carved Brass Cap. Our Crystal Jugs are available in a variety of patterns, shapes and sizes. We ensure to deliver these Antique Crystal Water Jugs safely and on time at your doorstep. We offer you these at nominal prices.